Gone are the days where finding a date online would often be met with incredulous looks and judgy comments. Here’s the low-down on popular dating apps in Singapore. 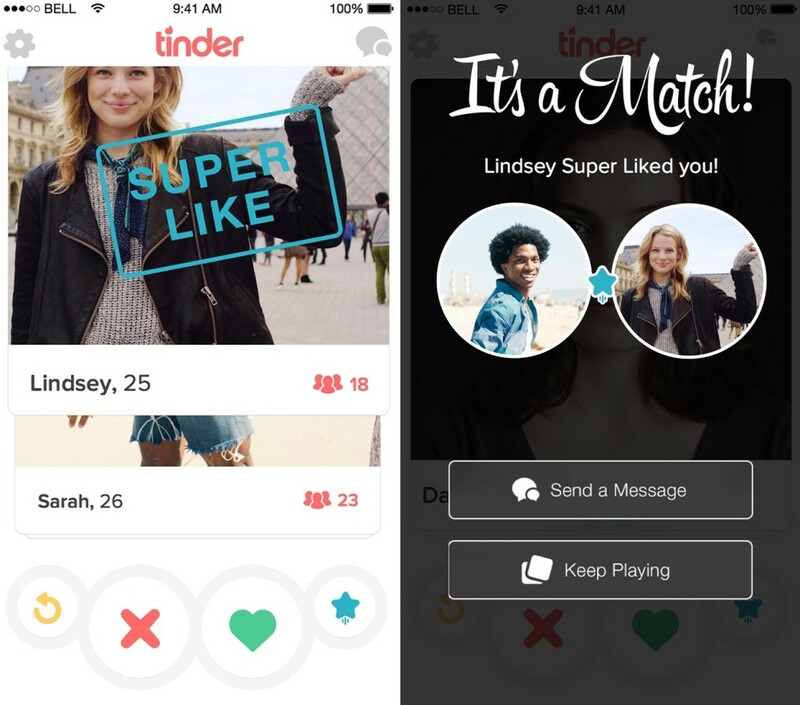 The low-down: Tinder needs no introduction – just login with your Facebook account and start swiping. The app will produce profiles for you to consider, and you swipe right to express your interest or swipe left to skip it. If a person you’ve expressed interest in has also swiped right on your profile, you’ll be able to chat with that person (and presumably find love). There’s also a Super Like function (swipe upwards), where you can let someone know you’re interested in them even before they make a decision about your profile. You can also set your Discovery Settings based on your current location, so the app will display matches who are closer to you. Pros: Tinder is one of the most popular dating apps in Singapore, so you’ll have a wider pool of people to connect with. The app is also easy to join and use – just login with your Facebook account and it will automatically fill out your profile for you. Cons: Connections on Tinder tend to be more superficial, especially since you have just one photo to sell yourself. Also, the whole swiping business is kind of iffy, because it’s dangerously easy to accidentally swipe right (or up) on a match you don’t want (“OMG what did I just do?!”). Best for: Expanding your social network, finding chat buddies and ehh…casual hookups? Let’s put it this way – you’re probably not going to find your soulmate on Tinder, but at least you’ll score a few dates. The low-down: You fill out your personal profile on the app and state your basic preferences for a match (i.e. Age, Gender, Height, Ethnicity). The app will then send you a curated match (or Bagel, as the app calls it) everyday at noon, and you can choose to Pass or Like that person. If both of you have expressed interest in each other, a chat box will pop up for you to start chatting. The only catch? The chat box is not permanent and will expire within a few days. 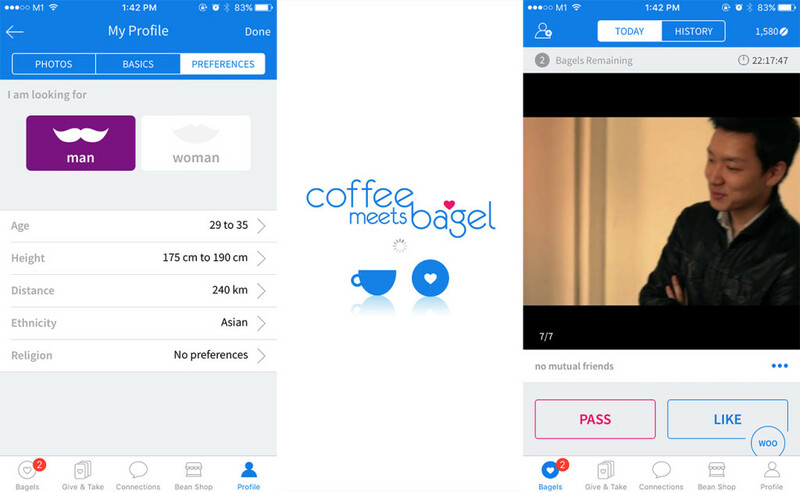 Coffee Meets Bagel encourages matches to exchange numbers or take things offline after chatting with each other for a few days. Not impressed with your Bagel of the day? The app has a Give & Take section with more potential matches, and you can use your beans (the in-app currency) for a chance to connect. You can also forward a profile to a friend who might be interested, and in turn, you’ll receive more beans to connect with matches. How’s that for sharing and caring? Pros: The app takes into account your Facebook connections, so you’re more likely to get matches who are friends of friends (you’ll never get matched with your direct Facebook friends though). The profiles on the app are also more detailed, so you can better suss out/stalk your match before clicking the Like button. Cons: It takes a fair bit of time and effort to fill out your profile, and there’s more pressure to connect with your date since the chat box expires in a few days. Also, the preference filters are quite basic, so don’t expect your Bagel to be the perfect match. Lastly, the user base in Singapore isn’t as wide as Tinder’s, so you might get the same Bagel as your friends who are also using the app. Best for: Meeting matches with mutual friends. The low-down: Happn is a location-based app that shows you matches you have “crossed paths with” (because you know, serendipity). Based on your phone’s location settings, the app will display people who have been in the same area recently. You can scroll through the profiles and choose to secretly like someone (the person won’t get a notification, but a chat line will open if he or she likes you too), or just put your pride on the line and openly like someone (the person will get a notification that you liked him or her). 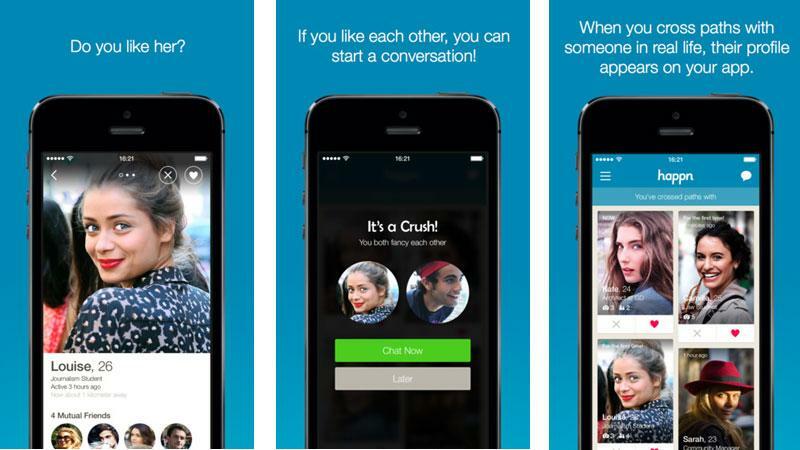 Pros: Happn is kind of a cross between Tinder and Coffee Meets Bagel. Just like Tinder, you get multiple matches based on your basic preferences and location (albeit more specific), but the profiles are a bit more detailed. The app also seems to be quite popular among expats, if that floats your boat. Cons: Is it not creepy that the app knows exactly where you’ve been and when? Also, I don’t know if it’s because your Location setting is turned on all the time, but the app seems to drain your phone battery rather quickly. Best for: People who tend to go out a lot, or who work in a “happening” area like Raffles Place or Orchard. You’re probably not going to get very many matches if you stay at home all the time. Also suitable for hopeless romantics who harbour hopes of meeting The One at their favourite cafe or bookstore (you know, reaching for the same coffee or book and all that jazz). 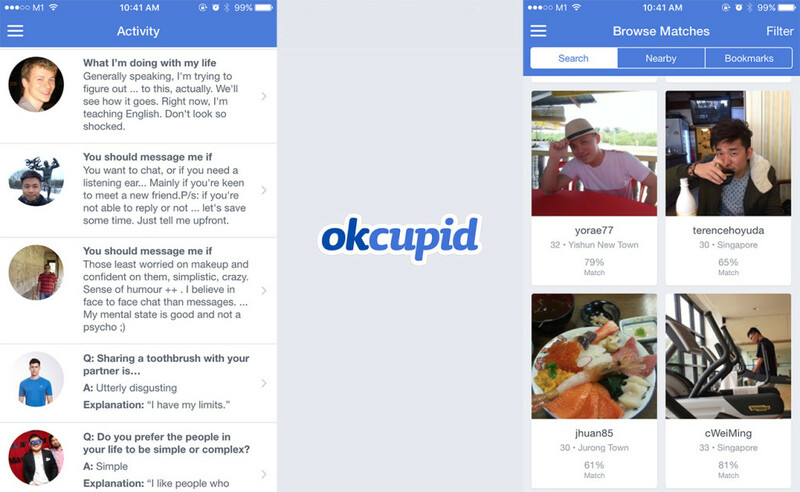 The low-down: Instead of matching you with people based on location or Facebook connections, OkCupid places more emphasis on compatibility (each match even has a percentage rating). Besides basic profile information, the app will have you answer a (seemingly) never-ending series of questions about everything from your views on life to…gun control. OkCupid then lists matches based on how well the person’s preferences match up with yours, and you can double tap to like the person’s profile (he or she will receive a notification) or start a conversation (you can chat with anyone on the app). The app also lets you see people who have clicked on your profile (and vice versa), but you can set your settings to browse anonymously. Pros: Your chances of getting suitable matches (based on personality traits and values) are probably higher than Tinder, especially since you have to answer countless questions about your life views, personality and opinions on love. The app also lets you use a username (as opposed to your real name), so you can keep your identity somewhat vague. Cons: Anyone can chat with you on OkCupid, so you’re bound to get the occasional creepy message like “let me see ur eyes baby” (true story). Also, your OkCupid profile is automatically set to public (meaning anyone on the Internet could possibly find you), so remember to switch your profile visibility to ‘Members Only’. Best for: Meeting people with similar interests, opinions and values. The low-down: Lunch Kaki is more of a social networking app, rather than a dating app (although you can meet dates through the app if you want). Instead of sending you matches to accept or reject, the app allows you to search for people to have lunch (or drinks) with. You can filter search results by location, age range, gender and even your intention for meeting up (i.e. company for lunch, job opportunity, making new friends). You can also create or join a Group Lunch, where up to 5 members can choose to meet up at a specified venue on a certain date and time. Kind of like a group date, if you will. Pros: Lunch Kaki is more about meeting new friends and making connections, so there’s less focus on superficial factors like your looks, age or job. The app’s Group Lunch function is also good for people who tend to be less shy in groups. Cons: Lunch Kaki doesn’t really take into account your dating preferences or Facebook connections, so your search results may be a bit more random than those on a dating app. Best for: People who want to expand their social circle, and are generally open to meeting new people (no strings attached). Also good for people who don’t like to lunch alone. 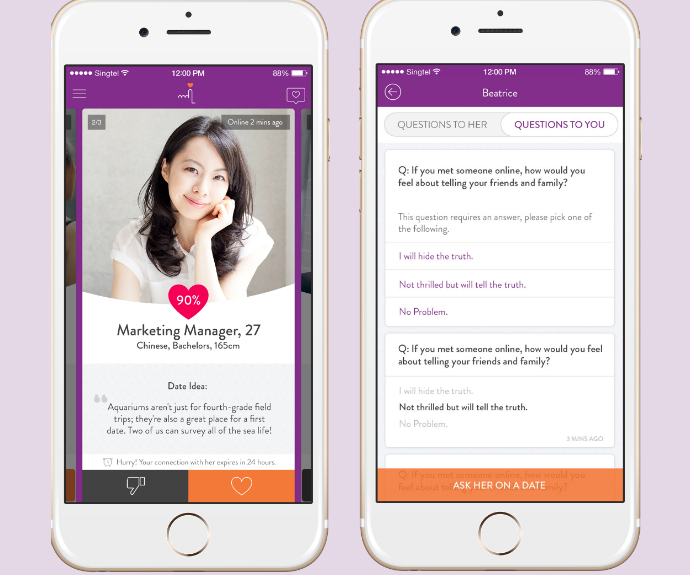 The low-down: LunchClick is a female-centric app by dating agency Lunch Actually, and it’s catered more towards people looking for serious dates and/or relationships (aka no casual hookups). Profiles are screened manually (they even use your NRIC to verify that you’re not already married), and the app sends you one quality match a day. Just like OkCupid, LunchClick uses personality and preference questions to determine more suitable matches for you. However, the selection process seems to be more stringent, especially since you only get one match a day. The app also has a function which allows you to search for places and propose a date with a match. Pros: LunchClick weeds out the crazies, so you won’t get any creepy people or players looking for casual hookups here. The nature of the app also encourages meeting up with your matches (rather than continuing to chat online), so you don’t have to feel desperate about wanting to take things offline. Cons: You have to input everything from your real name to NRIC to get your profile verified, so it can be somewhat intrusive or intimidating for some. Best for: People who are looking for a serious relationship.